On Saturday, February 23rd, “Mr. Gele” will make its screening debut at the Houston Community College in Houston, Texas! What a way to start out the year! This is indeed special because three years ago, we flew in to Houston, Texas to begin shooting and from the very onset, one of my wishes was to have our film screen in the same city. I envisioned having every single person who appeared on screen as well as offscreen sitting in a room watching the fruit of our labor. on the big screen. And in just a few weeks, my wish will soon become a reality! How cool is that?! And is if that was not enough, Segun Gele, the documentary’s star will be there for a Q & A and headwrap demonstration! I can’t wait for everyone in attendance to witness this man’s genius. It is indeed a sight to see. Please click the link below to reserve your free tickets TODAY! Not in the area, please share the link with family and friends who live in Houston!! We are going to the West African Film in HOUSTON!! We recently received word that our film, “Mr. Gele” has been selected to be an Official Selection in the West African Film Festival which is taking place in the very city we shot in, Houston, Texas back in July of 2016. It is also the home of Mr. Segun Gele and his family and we are beyond thrilled that the documentary can finally be viewed by his entire family and a plethora of his friends as well as clients in the Houston area. Hopefully, we will also be able to have some of his clients that were featured in the documentary to make an appearance. Fingers crossed! The West African Film Festival takes place in Houston, Texas on Saturday, February 23rd from 12-2pm in 2019 at the Houston Community College Alief Hayes Campus. Continue to watch this space for more information! The Tea Talks with Tomeka Podcast Feature! Click on any of these links to hear the interview: Enjoy! Tea Talks with Tomeka is a podcast that features interviews with female filmmakers and is a platform to celebrate and share their stories and projects. A special thanks to the Facebook Creative Workshop for recreating a video version of the Mr. Gele Film as well as a mini trailer suitable for Instagram & Facebook. The idea behind this was to help with social media engagement and branding. Fancy, huh! On September 26th, I had the pleasure of being invited to take part in an intensive female directors workshop which was a part of the SEEN initiative offered by the folks over at Facebook Creative Shop that took place at the SwitchYards Downtown Club in downtown Atlanta. SEEN is a movement that celebrates the underrepresented narratives and it connects audiences to the stories that shape our communities and address tangible ways for more films by women to be seen. The workshop (which started earlier in the day) hosted 7 female filmmakers (including yours truly) in the Atlanta area and we were blessed to receive one on one sessions with a Facebook rep and an editor that helped us refine each of our digital film assets and provided marketing tools to help promote our individual film projects as well as ourselves as filmmakers on social media platforms such as Facebook and Instagram. A special thanks to the Women in Film & Television Atlanta (WIFTA) for recommending me to be a part of this awesome opportunity. A new trailer and poster will be coming to a computer/mobile screen near you very soon. Watch this space :-) In the meantime, enjoy these photos from the event. Mr. Gele goes to New York Again! On Sunday, September 23rd, “Mr. Gele” screened in New York at the 11th Annual Family Day Celebration. It is an event that celebrates African culture through arts, games, dance, food, music and film. It is always a pleasure to have our film showcased to as many audiences as possible. Thanks to Mahen Bonetti and the rest of the African Film Festival team for making this happen. The Sidewalk Film Festival has come and gone but I had to make sure that I shared this beautiful poster that was created by the very talented Timi Majek of Skratchaus Studios. The idea was to incorporate the colors of the festival which were yellow and black. I have to say that this is my favorite film festival poster so far. I absolutely love it. I was deeply saddened that we could not make it to Birmingham, Alabama for our screening at the festival BUT beyond thrilled that it made it into the festival. A special thanks to Sidewalk for making “Mr. Gele” a part of this prestigious festival. No, we did not win BUT what an honor it was to receive a nomination at the BronzeLens Film Festival Award Show. Yes, “Mr. Gele” was nominated in the Documentary Shorts Category!!! The Award Show host, Palmer Williams kept the jokes coming and musician/actor, Tony Hightower had the audience entertained with his musical performances throughout the show. Nigerian actor and presenter, Joseph Benjamin was on board to present an award for the Best International Documentary. After the awards show, I had a wardrobe change and headed over to the W Hotel across the street for cocktails and conversation. I had the privilege of networking with several filmmakers and to my surprise ran into Ms. Ashley Everett, Beyonce’s lead dancer! The 9th BronzeLens Film Festival is now in full swing BUT it kicked off to a great start on Sunday, August 19th with the "Nollywood Screening Experience" event which was presented by the BronzeLens Film Festival and Iyalode Productions. As mentioned in my earlier post, our very own short documentary - "Mr. Gele" as well as Jade Osiberu's feature film, "Isoken" made it's Atlanta premiere at the SouthWest Arts Center in Atlanta, GA. It was such a delight to see "Mr. Gele" on the big screen. Whenever I watch it with a new audience, it always seems as if I am watching it for the very first time. The feeling makes up for all the hard work that went into making this film. "Isoken" was an absolute joy to experience from beginning to end. From the glamorous Nigerian fashion to the lovely production design and most importantly the well put together storyline, it was simply a glorious thing to watch. Well done, Jade! What a way to show off the Nigerian culture in such a classic way! The whole night was just a wonderful celebration of our culture and I was elated to be in the midst of it all. At the end of the screening, Joseph Benjamin, the lead actor in Isoken, Moji Sonoiki of Iyalode Productions and yours truly sat down for a talkback with UrbanGeekz.com Founder and CEO Kunbi Tinuoye (video coming soon). But what made the night the most special for me was having my husband, kids and close friends and family members there to support me. A special thanks to every single one that came out, it is truly appreciated more than you'll ever know! THANK YOU!! A special thanks to photographers Sheila Kuria, Julie Kabinu and a host of others who captured the photos below. Mr. Gele is going to Detroit! Yes, you heard right! "Mr. Gele" has been accepted into the African World Film Festival that is taking place in Detroit, Michigan. The festival takes place from August 17th - 19th and will feature several films and festivities including poetry, arts and craft , African drumming and a host of other events for the family all packed in just 2 days! Our film will be screened at the Charles H. Wright Museum of African American HIstory Theater on Sunday, August 19th at 2pm. It is indeed a great honor to be in this festival because part of the documentary was filmed in Dearborn, Michigan in September 2016. Talk about a full circle moment! Check out our lovely flyer designed by Graphic Designer Timi Majek! We got into the BronzeLens Film Festival! Say What? So I'll explain why I am excited about THIS festival. The BronzeLens Film Festival happened to be on my top 5 list of film festivals to submit to. AND it finally gets a debut at my home base, in Georgia...finally.! I have had so many folks ask me how and when they could see it in Atlanta and now I can finally announce a screening date and time which is one of the exciting aspects of this film festival journey. This year, for the very first time, the BronzeLens Film Festival announced all the selected films from the CNN studios in Atlanta, GA on Facebook Live on July 12th at noon! Now keep in mind that on this day, I drove, with my 2 kids in tow, to Charlotte, North Carolina for the CineOdyssey Film Festival and didn't make it in till about 11.50am. So immediately my kids and I got to our destination, I quickly logged onto Facebook Live to view the live broadcast. Within the next five minutes, all I heard was "Mr, Gele: The Man. The Story. The Craft". You should have seen my kids and I jump for joy. It was so hilarious because we were in a very quiet neighborhood and I'm sure we disrupted someone's siesta..lol (I haven't heard that word in a while). Yes, so "Mr. Gele" will be screening in Atlanta, GA on Sunday, August 19th at 3pm at the Southwest Arts Theater. It will be shown right before the screening of Isoken, directed and produced by Jade Osiberu. You can see the trailer to this very beautiful and colorful piece of work here. Journey to the CineOdyssey Festival in Charlotte, North Carolina! Since I returned from New York, its been really crazy. Shortly after NYAFF25, we got news that Mr. Gele got accepted into the 2nd Annual CineOdyssey Film Festival located in Charlotte, NC!! A few hours later, I returned in my traditional Nigerian outfit ( designed by Bridget John ) adorned with a pink colored turban scarf accompanied with a large chocolate brown fascinator courtesy of Segun Gele himself. You should have seen me walking down Tyron street. A police officer stopped, paid me a compliment on my outfit and asked what the occasion was. Ha! The screening went well and a Q & A ensued shortly after with the festival's programmer - Mr. Tre Smith who was such a great and gracious host. Thank you Tre! I also got interviewed on the red carpet as well. 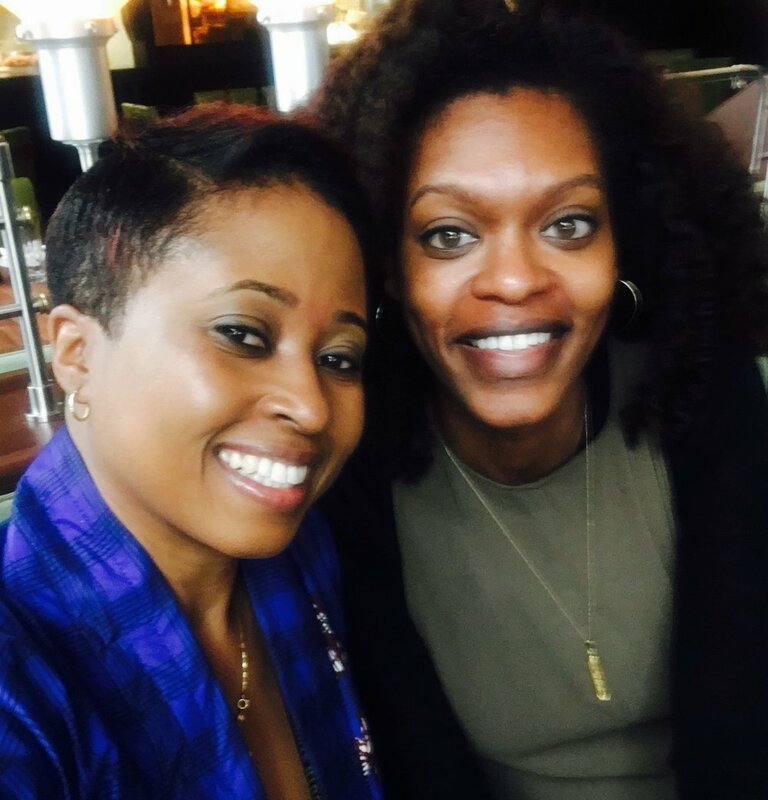 I had the pleasure of meeting multiple award winner, Christine Swanson (Come Share My Love, The Miki Howard Story, All About You, just to name a few) who was in attendance to screen her film BlacKorea. And a very special THANK YOU to my dear filmmaker sister girlfriend, Tomeka Winborne who came out to support me. Her film, AGED OUT screened on Saturday, July 14th and I got to support her as well. We women filmmakers have to be there for each other, you know! On Thursday, March 22nd 2018, I received an email notification stating that "Mr. Gele" had been officially selected to screen at the 25th New York African Film Festival ( NYAFF)! It was set to screen on Monday, May 21st at the famous Film Society Lincoln Center (right opposite the Julliard School) and was going to be a part of the festival's Nigeria focused shorts program! I had to keep this secret to myself until mid- April when the festival planned to make their official announcement on their website. The silence killed me and it was indeed torture keeping this exciting news to myself for what seemed to be an eternity. Before I knew it May 21st arrived and I headed on out to New York with our Associate Producer, Imani Warren. I thoroughly enjoyed watching movies from fellow African Filmmakers in the Diaspora and definitely was thrilled to see "Mr. Gele" on the big screen. I tell you, THAT never gets old. Just the experience of being in the midst of an audience that have their eyes fixated on the big screen watching our film is just PRICELESS! Afterwards, I got to participate in a Q & A session with the other filmmakers that were present at the screening. A little networking ensued amongst filmmakers and audiences alike. It was a great experience overall, one that I will never forget. The 42nd Cleveland International Film Festival came to an end on Sunday, April 15th 2018 and I am so proud and honored to be a part of such a prestigious film festival. I was there for just three days ( April 12th - 15th ) and in such a short amount of time, I got to meet and connect with so many people from the CIFF staff, movie goers and most especially fellow filmmakers. Of course, screening Mr. Gele in a movie theater for the very first time ever was quite mind blowing. I couldn't stop staring at the amount of audience members that filled the theater especially at our 2nd showing at 9am on a Saturday!! It was a sight that I will definitely never forget . One of my favorite highlights was finally meeting our super talented editor, Mimi Wilcox for the first time! We had been working virtually together via email and text for about a year and a half so it was quite a time meeting each other at the festival. I also had the privilege to chat with Dee Perry, a former Cleveland, Ohio radio host who was also part of the festival. We chatted about "Mr. Gele" and my CIFF42 journey. Being my very first interview, I was initially real nervous but Dee had a way of making you feel comfortable and she honestly made me forget I was even being interviewed. We were just enjoying great conversation. The CIFF42 staff were so amazing and extremely helpful in guiding me through the festival each day I was there. They did a superb job in putting the whole the festival together. So I'll stop here and let the photographs speak for themselves!! 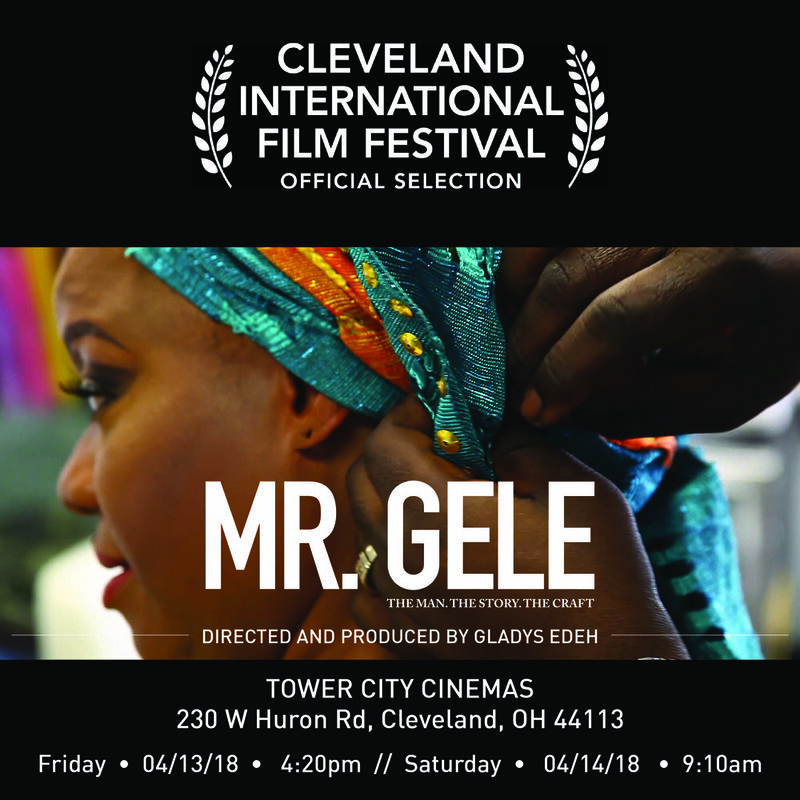 I am pleased to announce that "Mr. Gele" has been picked up by the Cleveland International Film Festival (CIFF) as an Official Selection! The 42nd CIFF, yes, 42nd ( meaning they've been in this festival game for a while) takes place April 4th - April 15th at the Tower City Cinemas in downtown Cleveland, Ohio. A total of 253 short films were selected to represent 72 countries and I cannot deny the excitement I feel to know that Mr. Gele is one of them. I am deeply moved and just beyond thrilled to experience this. My goal with this film was to reach a wider audience, an audience who may have not even had the opportunity to see a film like this. I have been to so many festivals, seen so many films and find that African stories ( or stories about Africans ) are mostly showcased in a negative light. But I am so glad that for a moment, audience members ( who are not familiar with African culture) can see a film filled with positivity and inspiration. Thank you so much to CIFF42 for this amazing honor. Click on the flyer below for the program lineup on the CIFF42 website. Yes, you heard right! We are now in the midst of a fundraiser campaign which was officially launched mid-January 2018. I must admit fundraising is not an easy feat. When I began my research about this process, I was hesitant to even get started. All the information I found about it was quite overwhelming and just seemed too complicated and time consuming. And so I procrastinated s long as I could but finally got my act together and started to gradually composing a GoFundMe page in December 2017. I spent so much time working on this page making sure it was perfect (well as perfect as I could possibly make it). Most importantly, I was very impressed with myself when I produced a fundraiser video (shown below) featuring myself (*gasp*) which helped jumpstart the campaign. I have always been behind the camera and developed a very comfortable place for myself there :-). But I admit today that deep down inside, I had fun doing it. I just had to get out of my head. Once I got over that hurdle, there was no stopping me. So without further ado, please do visit our GoFundMe page and DONATE. "Mr. Gele" has been a passion project for me for so long and now that it is completed, I need all the help I can get to push this film further than I can on my own. Funds from this campaign will go towards marketing, film festival submission fees, traveling costs and all the unexpected expenses that occur with promoting a film. Mr. Gele's Trailer screens at SCAD! In mid-November, I got an invitation from my dear Associate Producer, Imani Warren to screen the Mr. Gele trailer at the screening of Goddess, a short film by Tiara Luten. A film she served as a Production Coordinator. Of course, my answer was yes and the rest is history. The Mr. Gele Trailer screened at SCAD's Digital Media Center located in Atlanta, GA.
A little background - sometime last year, Imani invited me to SCAD to meet with Tiara and her team during one of her production meetings. Shortly after the meeting, we both shared our individual journeys on how we came to the decision to making our own movies. Let's just say, we shared a "sister moment". Now several months after that meeting, we have projects to share with the world. Amazing, how new connections lead to amazing opportunities. Never underestimate the power of networking!! Back to the present, it was quite exciting sitting with an audience and seeing the Mr. Gele trailer on the big screen, WOW! I cannot even imagine the feeling that will take over me when the entire film is screened!! Yikes! Congratulations to Tiara and the rest of her "Goddess" team for a successful screening! So today is an exciting day for me because my Top 10 Filmmaking Lessons article is featured on one of the most popular documentary film resource sites out there, Desktop Documentaries. In the pre-production phase of Mr. Gele, I came across Desktop Documentaries when I asked Google for the "best resource website for documentary filmmakers". Desktop-Documentaries.com was the first website to pop up. At the time, I was looking for a reliable site that could provide access to contract templates that pertained to documentaries. Upon further research of the site, I came across the Documentary Legal Forms Starter Pack. I purchased the package that instant without hesitation. It was exactly what I was looking for. These set of forms were a giant help to me and once I was able to customize them to suit my project, I was well on my way. And I can't thank Faith Fuller enough for all her efforts in creating this site. Faith is the founder and publisher of Desktop Documentaries and this website is full of essential tools and resources that cover topics on budgeting, fundraising, storytelling, surviving film festivals, distribution, grants, gear, filmmaker forums, you name it, she has it. For documentary filmmakers like myself, this site is a gold mine! It definitely helped me in my journey with completing, Mr. Gele. So you can imagine my delight when she asked me to contribute an article to share lessons that I have learned from making Mr. Gele! Of course, I said yes and now I am excited to share my top 10 filmmaking lessons with you. Top 10 Lessons Learning Making Documentary Short "Mr. Gele"
Thanks Faith for giving me this platform to share these lessons and for all that you do for documentary filmmakers out there! Your site truly ROCKS!!! In addition to providing resourceful documentary content on Desktop Documentaries, Faith Fuller is a documentary filmmaker whose work has been featured on CNN, Netflix and PBS, just to mention a few. Her first feature length documentary, Briars in the Cotton Patch is available on Amazon and streaming on Kanopy. The Mr. Gele Film Poster is HERE! So after months of conceptualizing, designing, re-doing and fine-tuning, we now have a finished poster. I would like to thank the lovely Ms Timi Majek of Skratchaus for bringing my idea to life. I met Timi through a mutual friend at a Thanksgiving party. As we began to have more conversations with each other, I learnt that she was a graphic designer. So as soon as I needed a film poster for my film, I approached her about creating one for me and she was fully on board. At first, I did not have a clear vision of what I wanted specifically on the poster but knew that it had to bright, colorful and unforgettable. After searching the Internet for every single documentary-style movie poster I could find for inspiration and wearing myself out, I finally decided to just settle on a simple, unique, striking and colorful concept. Since the film is centered around Segun's craftsmanship of tying the gele, why not include different patterns of gele fabric? But how do we display all these patterns on a poster? And this is how we came up with the idea to incorporate all the beautiful gele fabric patterns within a side profile of Segun. I liked the light golden color text because it's soft enough to allow the patterned gele image to stand out and the emerald green text was selected to incorporate the documentary subjects favorite color. Everything came together nicely and I am very happy with the end product. Thanks to Segun for taking the time and obliging us by sending all kinds of side profile photos that we asked for. Once he had someone take a photo of him at the airport while waiting on a flight ( smiles ). He is quite the busy man!! Fun Fact: Timi and I combined a collection of geles that we had in our own closets to make this happen. I took photographs of about 10-15 individual gele pieces which were all spread out in my home office ( this process was fun). I sent all images over to Timi and she did her magic. A few days later, we had this masterpiece shown below. A New Orleans Film Festival Invitation! Earlier this month, a dear friend of mine recommended me to the New Orleans Film Society to be invited as a filmmaker who lives and works in the South. I would be given All Access to attend all the events and watch as many movies as I wanted. Of course, I jumped on this opportunity to be a part of it and I am sure glad I did. The festival took place between October 11th through the 19th and I was able to only attend the festival for just two days. But I tell you my schedule filled up pretty fast as there was so much to do, but very little time. I was able to network with other filmmakers and make new friends, it was quite a delight. I watched as many films as I could and meet some incredible filmmakers and actors. I had the pleasure of meeting and chatting with Ms. Gabourey Sidibe (Empire, Precious) after her directorial debut, A Tale of Four screened as well as actor Jason Mitchell (Straight Outta Compton) shortly after his film Mudbound ( which is bound to win an Oscar, for sure) made it's debut in his hometown of New Orleans. I also made sure to attend some panels as well. One of the panels that I was looking forward to was the "Meet the Programmers" panel. The purpose of the panel was to provide a platform for filmmakers to ask questions about the different stages that happen after submitting a film to a festival. I raised the question about the lack of positive stories/images of Africa that are represented in film festivals in general. A great discussion followed and we came to the conclusion that there is a huge disconnect between both spectrums ( Film Festivals and African Filmmakers) and efforts need to be made especially on the programmers end to reach out to this community in order to have more access to films done by Africans. By the end of the panel, I made sure I shared my film with every programmer in attendance by giving them film business card that I had prepared mainly for this particular reason. Yes, I came ready! 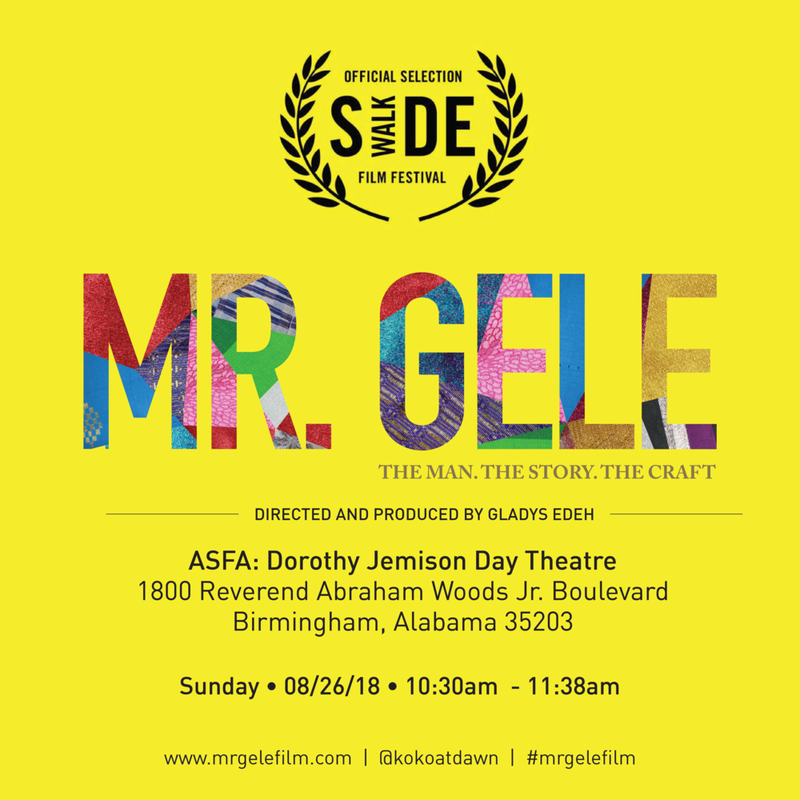 As a result of these interactions, I am now in communication with programmers from the Atlanta Film Festival, Cleveland International Film Festival, Vimeo, Sarasota Film Festival and the SideWalk Film Festival to have the Mr. Gele film submitted for consideration. Mission accomplished. So I am excited about the future of our film and we'll see how far we'll go!